Amitabh Bachchan (left), Shah Rukh Khan (middle), Hrithik Roshan (right) hold the record of maximum wins in this category four times. The Screen Award for Best Actress (Critics) is an Indian cinema award. The Star Screen Award for Best Actor(Critics) is an Indian cinema award. 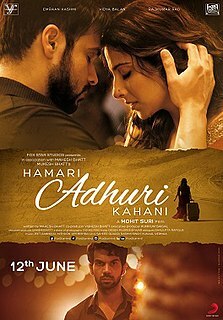 Hamari Adhuri Kahani is a 2015 Indian romantic drama film directed by Mohit Suri and produced by Mahesh Bhatt under the banner Vishesh Films and Fox Star Studios. The film stars Emraan Hashmi, Vidya Balan, and Rajkummar Rao. It is based on the love story of Bhatt's parents, Nanabhai Bhatt, Shirin Mohammad Ali and his stepmother. The film was released worldwide on 12 June 2015 receiving mixed reviews from critics. ↑ "Star Screen Awards 2011: Salman Khan, Vidya Balan win top honours". Economic Times. 7 Jan 2011. 1 2 "Winners of 22nd Annual Star Screen Awards 2015". Bollywood Hungama . 8 January 2016. Retrieved 8 January 2016. ↑ "Star Screen Awards 2017 full Winners List: Irrfan Khan, Rajkummar Rao, Vidya Balan, Neha Dhupia & Dangal win big!". International Business Times . 3 December 2017. Retrieved 3 December 2017.